Silver and pink sequined bodice and bustle, trimmed with silver braid and rosebud. Organza ruched sleeves and top skirt over satin under skirt. Hoop in skirt hem to create fullness. Head band with rosebud to finish the outfit. 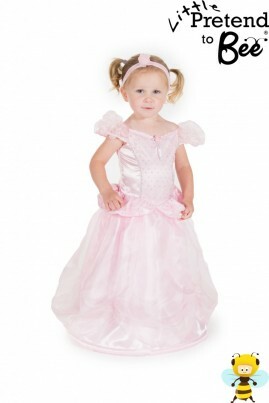 Velcro back fastening on dress and also on the head band.